I entered a Facebook challenge today, something I’m generally not inclined to do. The idea is to occupy Facebook with art. The concept is simple. A friend posted an image of a painting to his timeline. It was a painting by a 17th century master. The simple challenge goes like this. Whoever “likes” the post is assigned an artist chosen by the poster and is asked to share a painting by that artist on their own timeline. I was asked to share Degas. Edgar Degas was a 19th century Parisian Impressionist who grew up with a deep appreciation for music fostered by his parents, both of whom were accomplished musicians. The Degas painting I chose to share is titled L’Étoile (The Star). In it we see a lone ballerina on the stage, footlights shining brilliantly on her as she performs. She maintains a graceful, majestic pose “en pointe,” balancing on one leg. 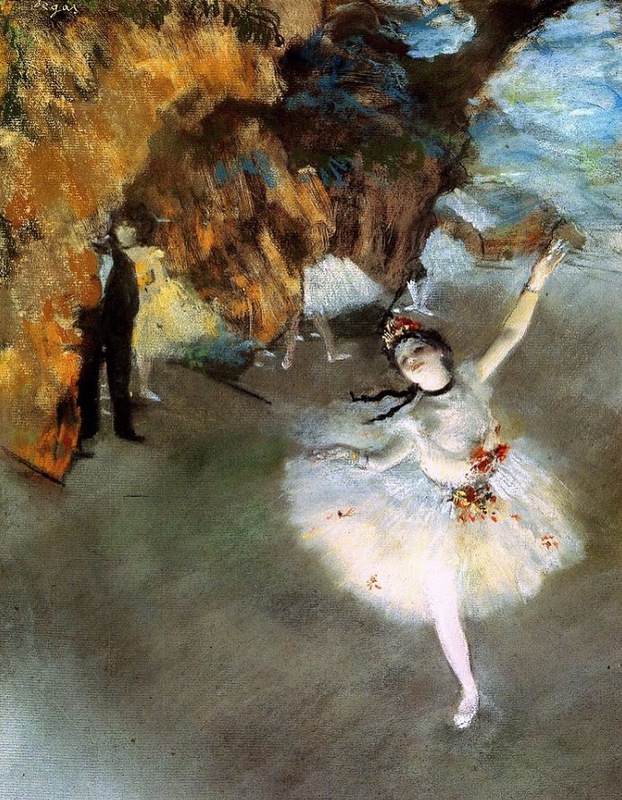 The hauntingly beautiful visual impressionism of Degas’ dancer immediately prompted my recollection of a song to accompany it. Musical impressionism, if you will. Following up on the success of their 1966 hit song, Walk Away Renée, the Left Banke, a baroque-rock band from New York, released Pretty Ballerina later that same year. Both songs were inspired by the girlfriend of a band member whose name was Renée. Pretty Ballerina features an oboe during the instrumental portion of the song, joining a string quartet before the music pauses then returns to the refrain of the song. Listen for yourself while gazing at the Degas and you might very well catch a glimpse of Renée pirouetting to the music. Her hair so brilliant that it hurt my eyes. I asked her for this dance and then she obliged me.